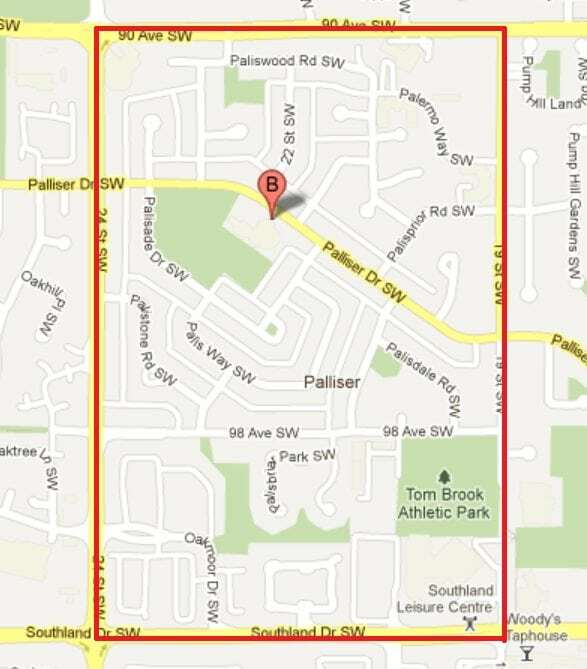 Palliser is a SW Calgary community host to a variety of well-established homes with larger than average lots sizes. Established in 1967, Palliser adopted its name from the famous Captain John Palliser who had an integral part in the early exploration and surveying of western Canada. Palliser included the area known as Pump Hill up until 1991, when they were segregated from each other into their own neighbourhoods. Known for its typically older luxury houses, abundance of recreational spaces and prime Calgary location, Palliser has become a popular living destination in southwest Calgary. Homes in this community are considerably less than in the neighbouring luxury neighbourhoods of Pump Hill and Bayview. One of the advantages of living in this well known Calgary community is the location. Only approximately six kilometers away from downtown Calgary, driving to and from the city centre takes about fifteen minutes. Driving to South Centre Mall or Chinook Mall takes even less time. Connectivity to main routes like Crowchild, Glenmore and Deerfoot take only minutes to reach that get you where you need to go around Calgary. Two of its best attributes include being less than 500m south of the Glenmore Reservoir and having South Land Leisure Centre located on the SE corner of the community. Recreational opportunities provided by these two places alone are endless! With an extremely low crime rate and quiet ambiance, it’s no wonder why Palliser is one of Calgary’s desirable southwest communities. Palliser students are designated to attend the same schools as its neighbouring community of Pump Hill. Chances are the kids will find friends in the area so attending the same school could be great! Both elementary and junior high are located in Palliser and Pump Hill, a fantastic convenience for parents. Elementary designation is to Nellie McClung (in Palliser), while junior high designation is to John Ware (in Pump Hill). High school students are to attend Henry Wise Wood which is somewhat close by, approximately 3.5 kilometers NE towards downtown Calgary. Questions about Southwest Calgary Homes? I would love to answer them for you! Get a hold of me today at 403-370-4180 or message me below! This is my commitment to you.